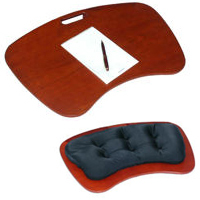 The Beanbag Schooldesk is the portable desk for your lap that lets you work or play from the comfort of your favorite chair, sofa, or bed, while keeping supplies close at hand. 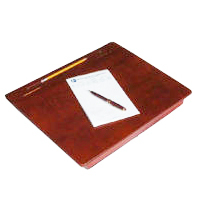 Expertly crafted, this unique product includes a 1.5" (3.8 cm) deep storage area ideal for storing pens, papers, calculators and other handy supplies and has a 12" (30.5 cm) wide x 0.5" (1.3 cm) deep 'groove' for pencils and pens to rest in on the top of the surface. The lid includes a spring-loaded mechanism which holds it open until you decide to close it. 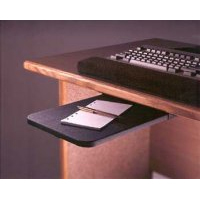 Designed as both a writing surface and a document holder, the Docuglide fits between your monitor and keyboard, encouraging better posture and improving workflow. 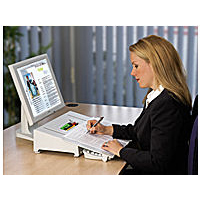 It can be pulled forward over the keyboard to allow document editing or note-taking, thus increasing efficiency and reducing the need for reaching or twisting. The inclined surface also creates the correct angle for reading your documents. A storage space for pens and other supplies is built in under the writing surface. Click here to see an animation showing the DocuGlide in action!. The Flexdesk has a metal frame and a solid sliding Plexiglass writing surface which can be brought down over your keyboard and then pushed back up when not needed. The angle of the writing surface is always sloped. A groove for pencils is located at the bottom of the writing easel, below the raised hard foam strip used to hold documents. 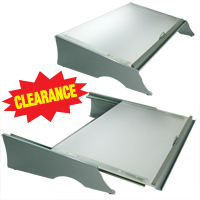 FLEX YOUR SAVINGS SALE - While Quantities Last, save $50.00 off the price of any FlexDesk. 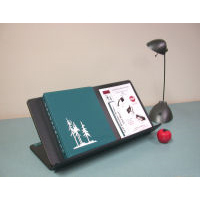 The Ultra Large Book / Document Holder and Writing Surface from Fox Bay Industries is one of the largest book / document holders currently available. 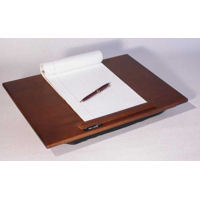 The document easel is a full 24" wide x 12" high and is equipped with a 2.375" deep hinged shelf designed to easily handle large documents, binders and books and capable of handling weight up to 25 lbs. For thinner documents the shelf easily folds to provide a 0.25" deep lip, making it also suitable as a slanted writing surface. The Ultra Large Book / Document Holder and Writing is made of ABS Plastic faced with Phenolic Composite to create an exceptionally strong product with high structural integrity. 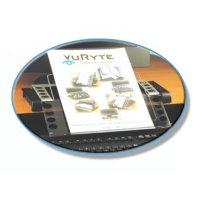 If you are looking primarily for a Heavy Duty Document Holder or have a need to elevate the materials above the desk you may wish to consider the Ultimate Document Holder which mounts to any monitor arm equipped with a VESA 100 mount. Writer's cramp? Arthritis? Hand / Wrist injuries or conditions? Ergonomically designed to fit the hand, the RING-PEN dramatically reduces stress on the fingers and wrist, by providing ridged support for your index finger. Easy to use, minimal gripping force is required, just guide and glide the tip with your finger and thumb. No more blisters or calluses on the middle finger! Each 3 pack comes with 5 additional blue or black refills (and of course, 1 nib in the pen). Note: As this product has consumables, we cannot offer a return policy on this item. Also please note that this pen only functions correctly when used at a 60° or higher angle and will not write if used in a 'flatter' orientation. 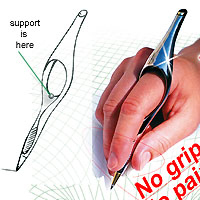 Refill accessory for the No-Grip Ring Pen, available with blue ink. Buy more than one refill and save money!